The Other Side blog: Post 3000! A long time ago I hit 1000 posts. 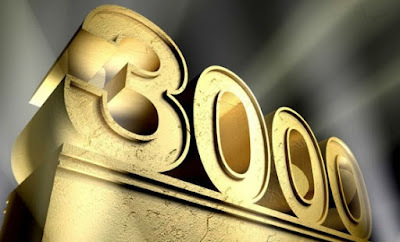 Today, a little more than two years later I am hitting 3000 posts! Not sure how to celebrate such an achievement. 3000, more so than 2000, make me think of the future. Futurama, Mystery Science Theatre 3000 and even my own Greyhawk 3000/Mystara 3001 game using White Star and Calidar. I also have to admit I am very excited for Retrostar. It's not old school, per se, but does capture the feel of 70s and early 80s sci-fi. Coming up on my year-end reviews and looking ahead features. What would YOU like to see for my next 1000 posts? 3000!? wow that is quite an achievement. Thanks for doing this blog, it is always a good read. 3000 is a huge achievement! I think I'm only at about 1300 posts after about 6 years of blogging. Congratulations on such diligence in blogging.